Anchor releases a slightly different Winter seasonal each year, known as Christmas Ale. They've been doing this since 1975, back in the Dark Ages of American beer. The beers age gracefully, and I intend to save a couple bottles for an update next Winter. This year's offering, the 34th, is in the classic stout little Anchor bottle adorned with an achingly beautiful label featuring a Jeffery Pine tree. Each year's Christmas Ale features a different tree, a nod to the tradition of trees representing the Winter Solstice, when the world is born anew. Anchor are quite secretive with the details each year, not releasing (as far as I've found anyway, feel free to correct me in the comments) the specific style, the alcohol content, or the ingredients. Even the name doesn't seem to be nailed down 100%, as it appears with names as varied as Our Special Ale and Merry Christmas and Happy New Year. 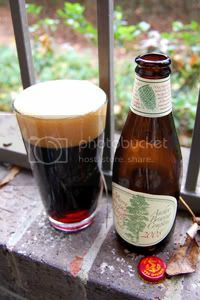 Anchor simply calls it Christmas Ale on their site, so that's what I'm going with. For simplicity's sake, I've listed the beer as a Winter Warmer and the ABV as ~6.0% (I've seen it listed, without documentation, anywhere from 5.5% to 8%). Let's try to unravel this year's mystery. Appearance: A thick, dark brown body allows hardly any light to penetrate. What light does manage to make its way through manifests as brilliant ruby. Pours a healthy caramel-colored, two-finger high head that leaves dramatic lacing. Simply put, this is a gorgeous beer. Aroma: Dominant are cloves and spices, especially nutmeg that is reminiscent of eggnog (quite appropriate for the season), with some pine on the edges. There is a solid roasted malt background, but not much in the way of hops. A very unique start. Taste: Not quite as brilliant in the mouth as in the nose, but still damn good. Sour dark malt with a lot less of the spices coming through. There's lots of chocolate and dark fruit with some pine coming from (I'm guessing) the hops. I'm not sure what the ABV is exactly, but I would estimate its somewhere between 5.5 and 6.5% ABV. Mouthfeel: A chewy medium body with moderate carbonation. Even though I don't know the exact style, this seems a little thinner than it should be. The finish is somewhat dry. Drinkability: Definitely something you savor over a period of time, Christmas Ale is something I would enjoy at a rate of one glass per evening. Verdict: A great holiday sipper, with a complex malt body and lots of spicy fireworks. I'm very much looking forward to trying this vintage again this time next year, to see what has changed. I have some of this in my fridge, too. I actually can't say I enjoyed this beer as much as I did last year. Something about the intensity of the fruit and spice flavors seems to overpower the natural taste of the ale. I've heard a lot of people with the opinion that he 2008 vintage is one of the weaker versions. I wish I had known enough last year to pick up the 2007 version, but alas 2008 was my first.